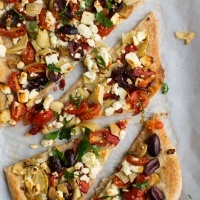 Mediterranean Flatbread | Naturally.Mediterranean Flatbread | Naturally. In a small bowl, combined tomatoes, olives, artichokes, roasted red peppers, garlic, lime juice, and parsley. Toss until well combined and set aside. Preheat oven to 450˚. Roll the pizza dough out in a rectangle that is roughly 8” by 12”. Transfer to an oiled or parchment covered baking tray. Rub dough with olive oil and sprinkle olive mixture evenly over dough. Follow with feta, starting with 1 ounce and adding more as desired. Bake for 12 to 15 minutes until crust is crisp. Remove, cut, sprinkle with parsley and serve. If a bit more crispness is desired after baking, turn broiler on and place baked flatbread until for 30 to 60 seconds to lightly brown the top and crisp the top part of the crust. If using parchment paper, be sure to remove from under the flatbread before doing this.